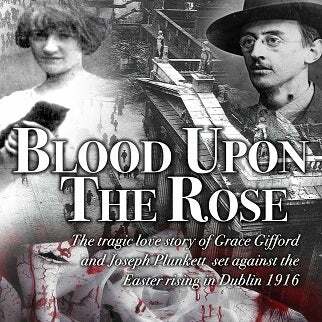 Blood Upon The Rose, written and directed by Gerry Cunningham is a sad but true, love story set in Dublin during Easter week 1916. Grace Gifford hailing from a Dublin middle-class Unionist background falls in love with leading Irish revolutionary Joseph Plunkett. Both agree to marry on Easter Sunday 1916 but a rising against British Rule in Ireland has been planned for that very day. Plunkett is vital to the revolutionaries plans as he is the military director of operations. Grace while sympathising with his cause prefers to wait until the outcome of the rising before giving her hand in marriage. In some of the most incredible scenes ever staged, the rising is defeated and Plunkett along with his comrades are sentenced to death by execution shortly afterwards in Kilmainham Gaol. Grace and Joseph plead to marry in the small chapel in the prison that very night. Their wish is granted and after exchanging wedding vows in the dark damp confines of the prison chapel, Plunkett is taken out the next morning and executed. Their tragic love story to this very day has found a place in the nation's heart. Set against the background of the Easter Rising 1916, Cunningham in his well-researched writing introduces us to the lesser known internal difficulties within the Irish Volunteers. Eoin McNeil, leader of the Volunteers struggles to come to terms with the plans of Padraig Pearse, militant leader of the IRB, a secret republican movement that had successfully infiltrated all units of the Volunteers. Pearse wants blood spilt in order to awaken a nation from its colonial slumber. Their clash has disastrous consequences for the rising. The musical/drama “Blood Upon The Rose” will bring you on an emotional rollercoaster that will live long in the memory. “Let the Nation Rise”,”The Hungry Eye Sees Far‘ and the beautiful song “Grace”, penned in 1985 by Sean and Frank o' Meara, among others, will instill and reinforce your pride in the men and women who gave everything for the cause of Irish freedom over a century ago. Sit back and let us take you right into the heart of Dublin, Easter 1916. "Not only Ireland but the world should see this genuine tribute to the men of 1916"... ............Betty Devlin (nee Scullin) whose father Frank Scullin fought as part of Plunkett's Kimmage Army in the GPO on Easter Monday 1916.